I didn’t plan going to go to Sylt at first, as I thought the price giving would not be in Sylt this year. But then I checked my mail on saturday evening and saw a mail from the PWA saying that the price giving would be tomorrow at 15.30 in Sylt. With just 21 hours to go, my mom and I packed some stuff and jumped into the car. We arrived at about twelve in the morning on sunday so we still had some time to walk around and enjoy. At the end I didn’t have a lot of time in Sylt, but I enjoyed every moment I was there. I got my trophy’s for becoming 3rd in the women’s freestyle and youth world champion in the women’s freestyle. There were lot’s of crowds, the atmosphere was great and it was nice to see some friends before everybody’s leaving for winter training! After the price giving we left home straight away, because school started at 8.25 the next day …. 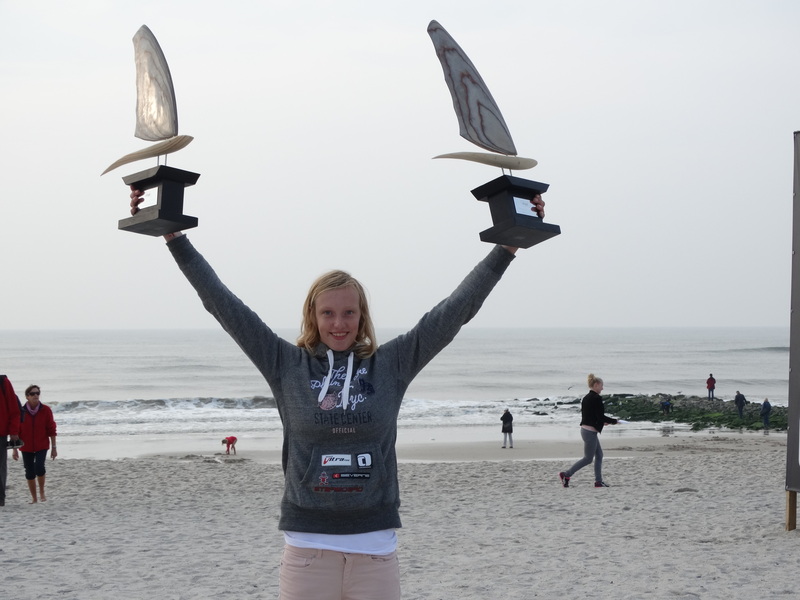 I am super happy with my result and the experiences I had this year: Bonaire….. Fuerte….. the indoor…… and Sylt. The winter in Holland is coming slowly, and hopefully so is the wind! I’m super motivated to train as much as possible!